Above: A Wedding in Cana: my sister Jill and her husband Rusty, married in the Wedding Church at Cana of Galilee, Tuesday, October 18, 2011. Photo courtesy of Stephen Ray, their pilgrimage guide, online at Catholic-Convert.com. On the third day there was a wedding in Cana in Galilee, and the mother of Jesus was there. Jesus and his disciples were also invited to the wedding. When the wine ran short, the mother of Jesus said to him, “They have no wine.” And Jesus said to her, “Woman, how does your concern affect me? My hour has not yet come.” His mother said to the servers, “Do whatever he tells you.” Now there were six stone water jars there for Jewish ceremonial washings, each holding twenty to thirty gallons. Jesus told them, “Fill the jars with water.” So they filled them to the brim. Then he told them, “Draw some out now and take it to the headwaiter.” So they took it. And when the headwaiter tasted the water that had become wine, without knowing where it came from (although the servers who had drawn the water knew), the headwaiter called the bridegroom and said to him, “Everyone serves good wine first, and then when people have drunk freely, an inferior one; but you have kept the good wine until now.” Jesus did this as the beginning of his signs in Cana in Galilee and so revealed his glory, and his disciples began to believe in him. 4:18 was what time? 11:18 in Jerusalem. And they were leaving Cana for lunch, according to the itinerary, so they may be there right now. Jodi slept peacefully beside me. I lay on my back, eyes wide, and began to pray. I learned later, via text, that at 11:18 local time, Jill and Rusty were likely walking up the aisle in the Wedding Church in Cana. For the half hour I lay awake, praying, they were promising their lives to each other. Those moments are captured in video below, courtesy of their pilgrimage guide Steve Ray at Catholic-Convert.com and FootprintsOfGodPilgrimages.com. I wore a tux in Jill’s first wedding, a lovely outdoor ceremony on a little island in the Chippewa River in Michigan where her high-school sweetheart had grown up. We were fallen-away Catholics then — my mom, Jill, and I — and her first husband’s family was of no particular faith that I knew, so they were married by a the pastor of the Wheatland Church of Christ, who was a neighbor of my folks, in a short ecumenical service. It was a day of great joy, the start of something wonderful — though we had no idea in what way. Today she has two wonderful children, Kayla and Kyle, and an ex-husband who is remarried, and who by all accounts is a supportive dad and a good friend to her again. 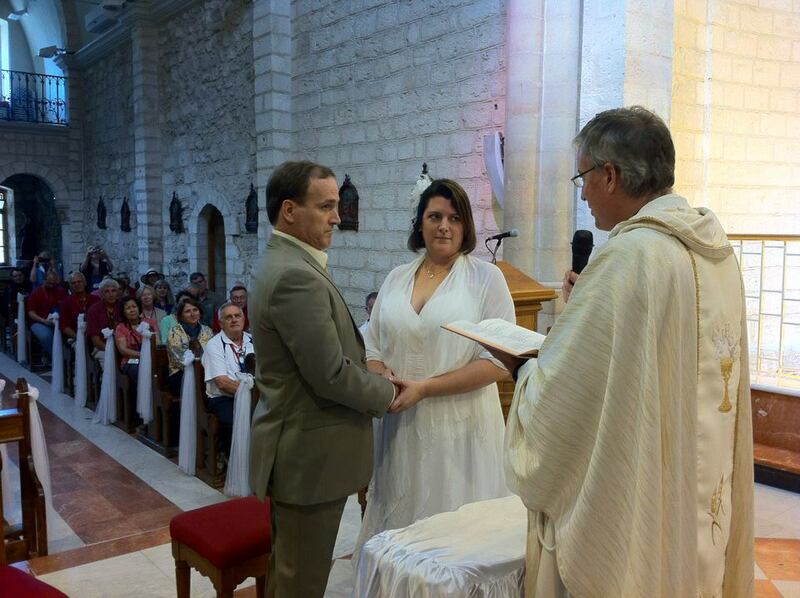 In the months that followed the breakup, she found herself seeking God, and, with Jodi’s conversion of me and Gabe’s youthful interest in the priesthood as inspiration, ultimately came back to the Catholic church. As fate (or faith) would have it, I was there in Michigan with her when she met with her priest to discuss returning to the Church and the sacraments, and having her teen and her tween baptized. I was there when, after going to Reconciliation for the first time in decades, she received the Eucharist for the first time. And when her priest told her when the baptism of the kids would be, Jill and I were amazed to realize that Jodi and I were already planning to be back in Michigan that weekend — since she had just told us that she wanted us to be their godparents. We were also in Michigan this past Easter when my niece and nephew made their First Communion, and Jill and Kayla were confirmed. This was my first opportunity to meet the man my sister had begun seeing during the previous year — a man with whom she was unabashedly smitten. After all she had been through, it had been strange to listen from afar as she met and fell in love with somebody new. I’ve watched a handful of female friends go through divorce, then quickly and repeatedly fall for the wrong guys, and I had to swallow hard. I don’t want to see her hurt again. My parents, on the other hand, had met Rusty and seemed to like what they saw. That helped, especially because Dad has a knack for gauging people. Still, it was difficult to show up at Easter as the only close family member who hadn’t meant this man — and as the person (quite frankly) who was most inclined to not like him. I had my guard and filters up, but he came through clean: a genuinely nice guy who likes good music, a Catholic convert who enjoys talking about his faith, a veteran of the Navy and other life battles who loves his young son and his aging parents, and a good man who did not hesitate to say that he would gladly spend his life working hard to treat my sister right and to get her to Heaven. They told us that weekend that they were planning to marry, although they weren’t yet engaged. Then they told us they planned to do it at the church in Cana, in the Holy Land, on a pilgrimage to learn more about their faith. We were amazed. How much more different could this possibly be from her first wedding? How far had my sister journeyed, in such a short time? “Do whatever he tells you” — these words from Our Blessed Mother from the Gospel account of the miraculous wedding at Cana were a statement of faith in her son, that, although He insisted it was not yet his time, He would not allow a need to go unmet for God’s faithful — that from misfortune he would work wonders in order to manifest God’s love in our lives. He did it again and again during his ministry, and again in the most profound way on the cross on Calvary. And again yesterday, at another wedding in Cana. Before she left, Jill told me she was thinking of ways she could have her closest family and friends with her on her wedding day: a family rosary, a lucky coin, that sort of thing. From Jodi and me and our family, she asked that I write a prayer for them to meditate upon. First, ask the priest to hear your confessions, that your hearts may be pure and open to God’s graces. Second, read the only scripture that ever mattered to me at the time of our marriage (and the only detail of our wedding I insisted upon): Tobit 8:4-9.
made for each other, as complements and co-creators, living and life-giving. in marriage and family life. for Your living example of selflessness and devotion shown by Your Son, Our Lord, Jesus Christ. and that we may be a beacon to draw others nearer to You. This we pray with confidence in the name of Jesus Christ and through the power of the Holy Spirit. Amen. Sister, we were just carrying the water. Dang, must be some dust in my house as my eye's are wanting to water! Same thing happened to me as to Jinglebob!! I'm happy for all of you! !